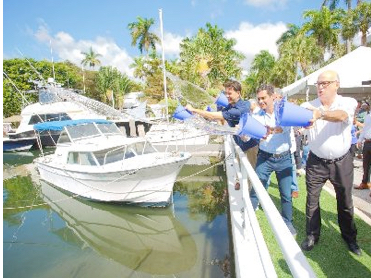 The Fairview Flood Mitigation project — with its focus on reducing flooding in a bayfront neighborhood — is a fitting start to the $400 million Miami Forever Bond program that voters approved in November 2017. Miami Forever aims to make Miami the most resilient city in the world through innovative infrastructure investments and is being led by the City’s Office of Capital Improvements. Located in the city’s low-lying Fair Isle neighborhood, which experiences regular flooding, the Fairview Flood Mitigation project will tackle the local impacts of sea-level rise head-on. Phase I of the project consists of the construction of a centralized and interconnected drainage collection system, raising existing roadways in the neighborhood, and constructing new driveway approaches and concrete curbs. Phase II will include construction of a stormwater pump station, drainage wells and design of a force main outfall to replace the existing gravity outfall. The pump station will include a backup generator to power it in the event of an electrical outage.